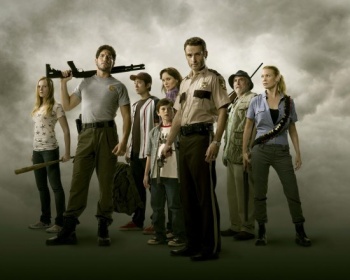 It's apparently out with the old, and in with the new - for every episode - on the hit zombie TV show The Walking Dead. Frank Darabont, executive producer, director and writer for The Walking Dead TV show, has supposedly fired all of the show's writers, and is considering not having a writing team for the next season. Instead, Darabont would farm script-writing duties out to freelancers on an episode-by-episode basis. While nothing has been finalized yet, Darabont is said to be keenly aware that the staff writers wrote only two of the first season's six episodes. Of the remaining four, Robert Kirkman - executive producer and co-creator of the original Walking Dead comic book - wrote one, and freelance writer Glen Mazzara wrote another, and Darabont himself wrote two. The freelancer model is fairly common in the UK, but unusual in the US. If Darabont does decide to eschew a writing staff altogether, he may have difficulty with writers' unions and putting together a thirteen episode season on such a piecemeal basis. He has more time than usual to get things ready however, as AMC is considering waiting until October of next year to launch the second season.